Before the pot boils, it simmers. Between the conception and the creation falls the shadow. The cusp of something about to be born. A rough beast slouching toward Bethlehem. It is the ambiguous time between the discrete textbook ages of history that we name that is most interesting. We generally name Romanticism in art as something that thrived in the first half of the 19th century. If it has a birth date, it is usually given as 1798, when William Wordsworth and Samuel Taylor Coleridge first published their Lyrical Ballads, a book of poems that seemed to be a clean break with the past. Certainly there are other dates we could choose. In music, we often give 1805 and the first performance of Beethoven’s Eroica symphony. In politics, it might be 1789 and the fall of the Bastille in Paris. 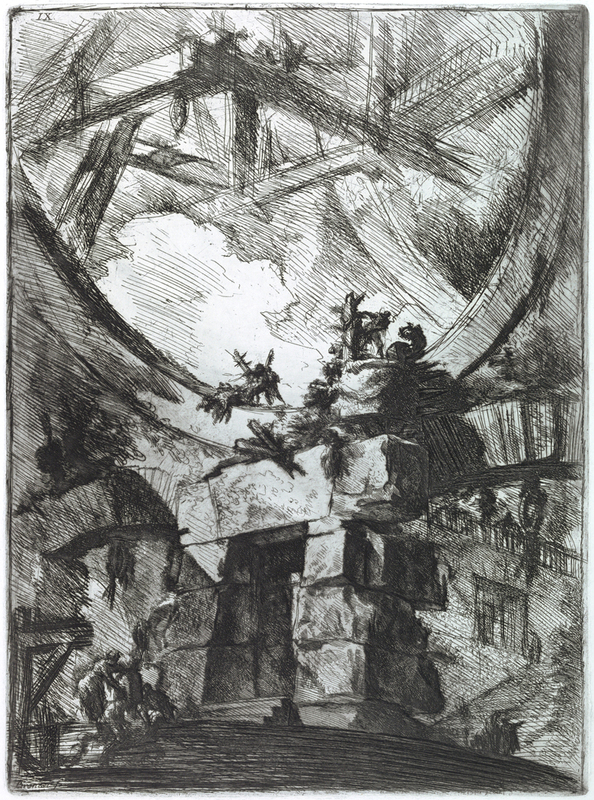 Or Goya’s Caprichos, published in 1799. Picking a single date is absurd, because Romanticism wasn’t born like Athena, burst instantly from the head of Zeus. It wasn’t born at all; rather, it accumulated. And in the 50 or so years before we gave the movement a name, it kept popping its head up above the surface in odd moments, letting us know it was coming. Before Beethoven, there were the Sturm und Drang symphonies of Joseph Haydn, beginning with his Symphony No. 39 in G-minor of 1765. There was Goethe’s Sorrows of Young Werther of 1774, that set all of Europe to sympathetic weeping and toward a penchant for suicide. 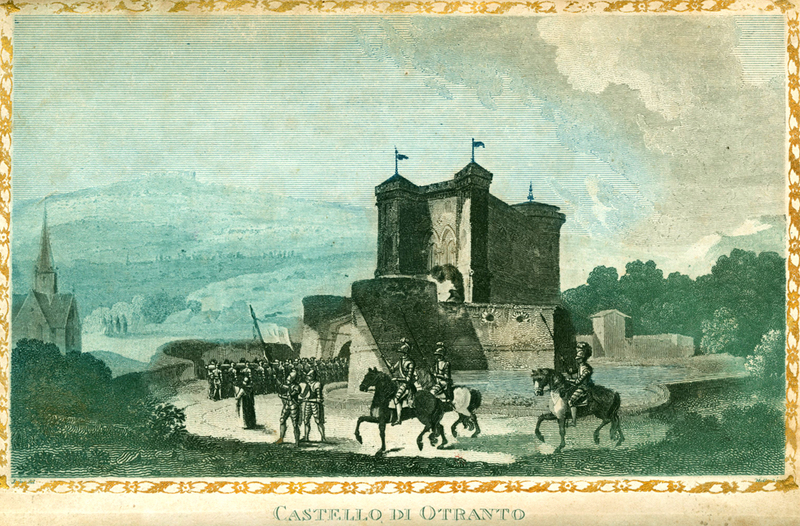 In English, there was Horace Walpole’s Castle of Otranto, from 1764 that began a craze for Gothic novels, with their attendant gloom, rattling chains and ghosts in dungeons. There were the faux Celtic sagas that James McPherson published in 1765 as The Works of Ossian. 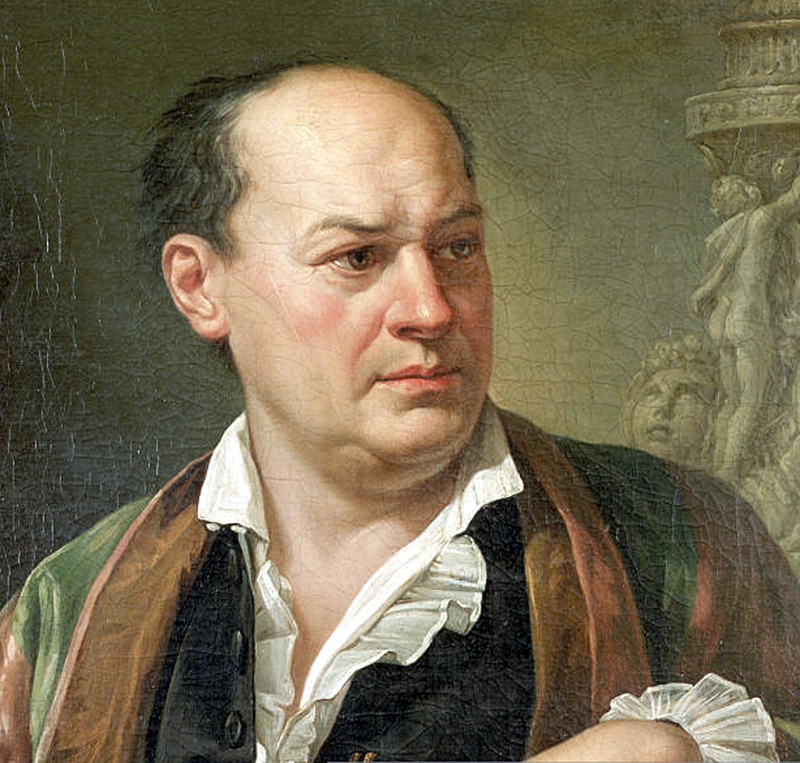 All these, and many more came as a sort of antidote to the rationality of the Enlightenment. 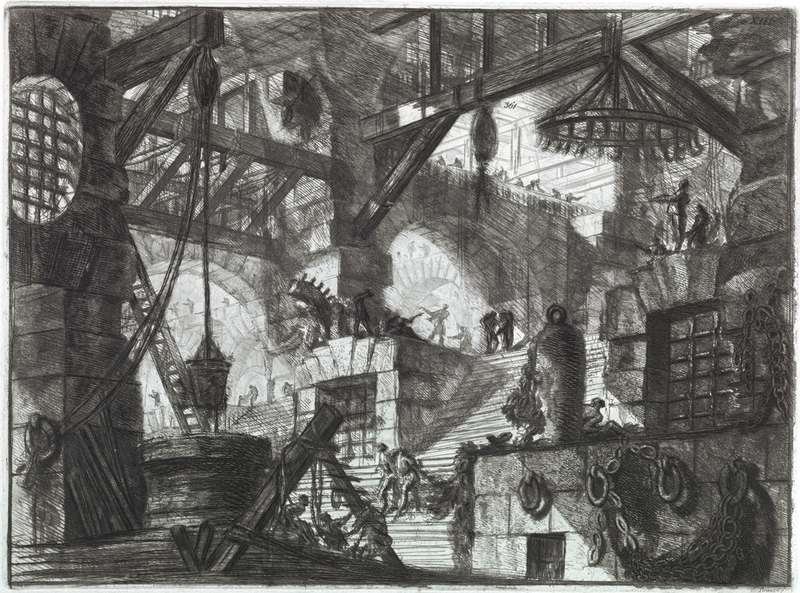 And, there are the prisons of Giovanni Battista Piranesi. 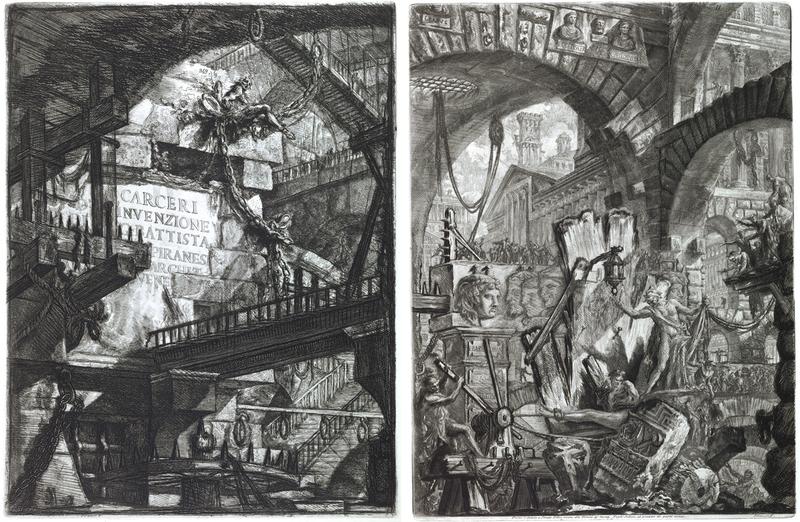 These 16 etchings are sui generis in Piranesi’s vast output, and a fierce eruption rising to the surface of the simmering pot. 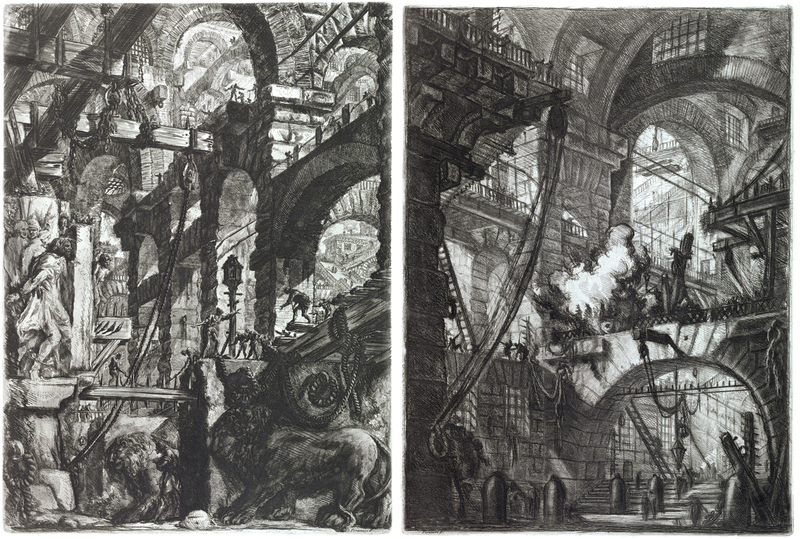 Piranesi (1729-1778) was an architect, archeologist and printmaker who was fascinated by the ruins of Ancient Rome. While his architectural work consisted of a single building, and his archeology was more of a sideline, it is as an etcher and engraver that he became famous. One of the best printmakers of his time, his intricate detail and exacting craftsmanship were exceptional. Half his work functioned as a record of archeological evidence, cataloguing ancient architectural detail; the other half was as a profitable creator of souvenirs for European aristocracy, mainly British, who were taking the “Grand Tour” of Europe to flesh out their educations. These prints, known as Vedute, or “Views,” were in the Picturesque tradition — ruins covered in vines and under the arches of which lived peasants. It was a rich tradition in the second half of the 18th Century, and a bankable genre for artists wishing to make a good living. During this time, the rediscovery of Pompeii and Herculaneum prompted an interest in the past, including Ancient Greece, Egypt and the Gothic. 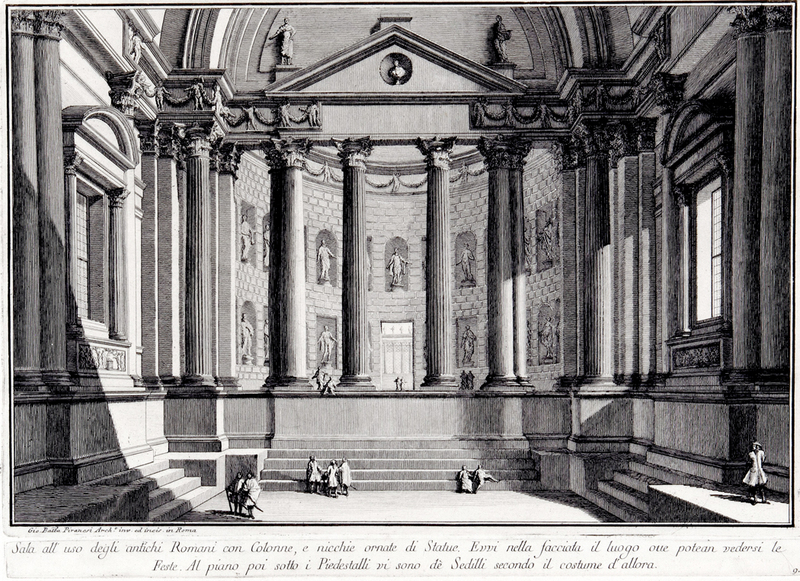 Johann Joachim Winckelmann was writing ecstatically about the glory that was Greece and the grandeur that was Rome. 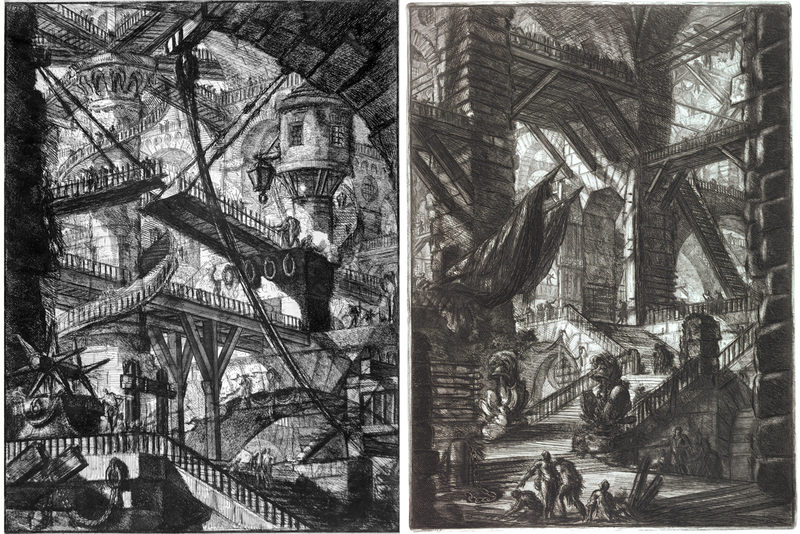 Piranesi rode this rising tide and published hundreds of vedute engravings. 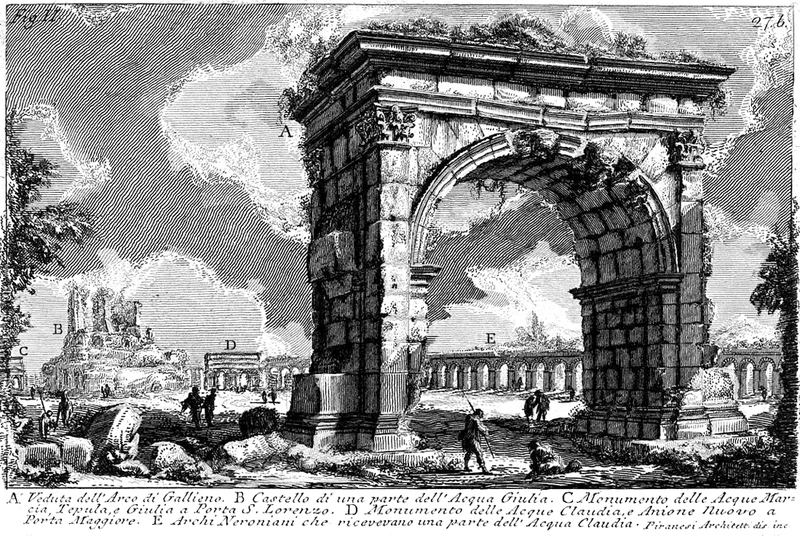 Many of these transcended the reality of the ruins left in Rome and the Campagna and were pure fantasies of what might have been. The more extravagant the fantasy, the better. 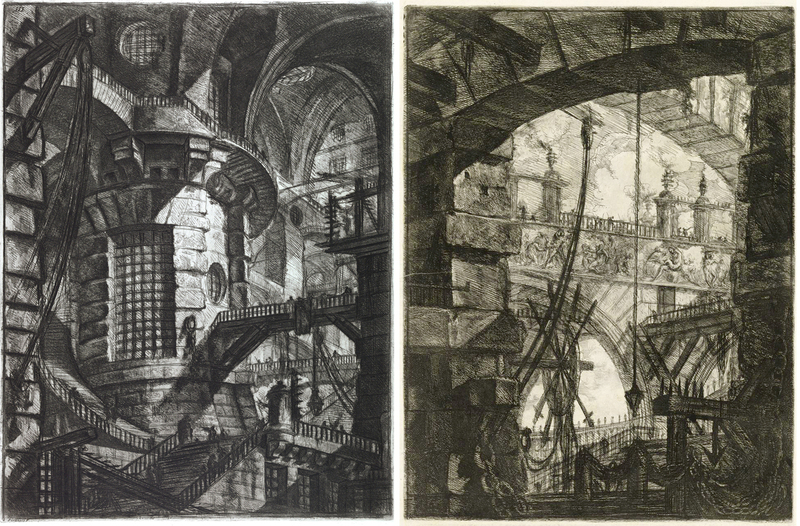 In the midst of these popular prints, in the late 1740s, Piranesi began making a series of fantasy prints of imaginary prisons, or carceri, built of immense dank spaces and torture devices. 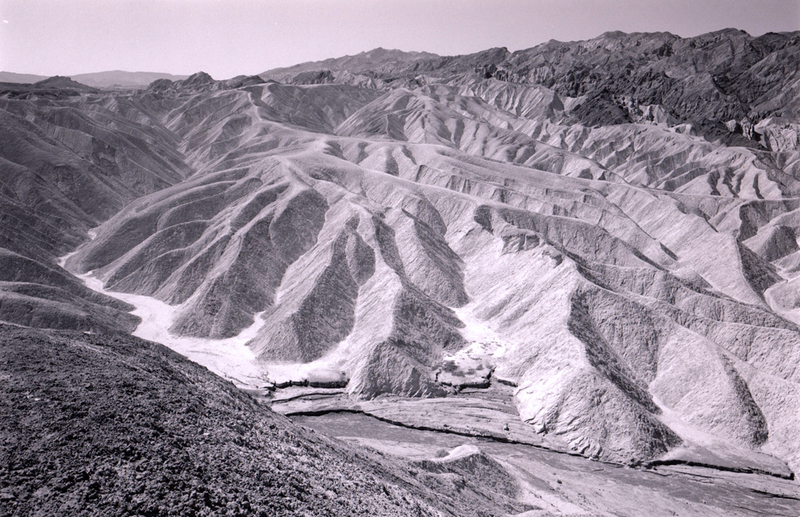 Each of the original 14 prints was roughly the size of a 16-by-20 photograph, large by most etching standards. But they were an anomaly, and didn’t sell well. Surely, they came a decade too early. 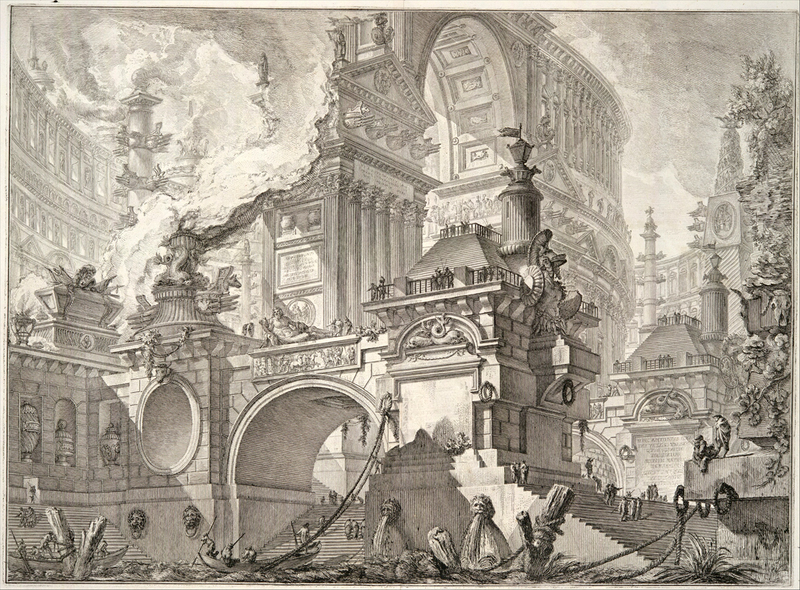 For, in 1761, Piranesi reworked the original plates, adding two new ones, and republished them as Carceri d’invenzione, or “imaginary prisons.” According to Belgian writer, Marguerite Yourcenar, they represent “negation of time, incoherence of space, suggested levitation, intoxication of the impossible reconciled or transcended.” And can best be understood as externalizations of internal mental and emotional states. Nightmares, even. 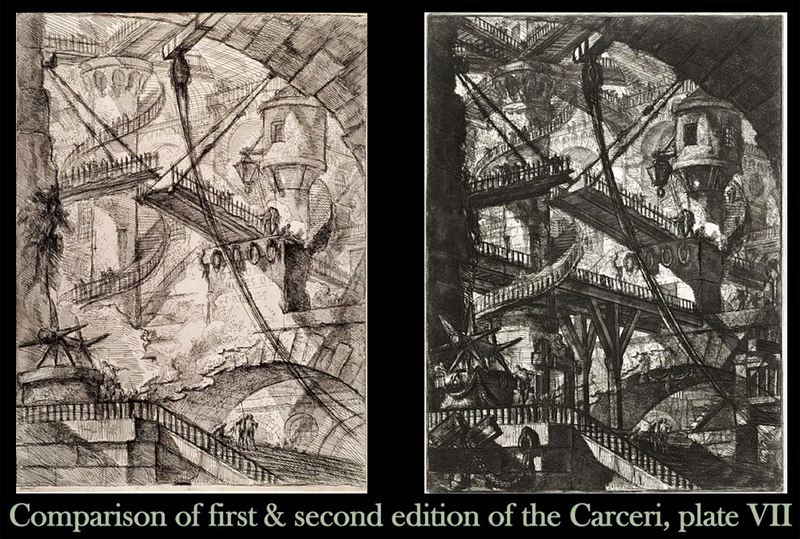 Comparing the first and second states of the series, one sees them change from rather sketchy drawings to richly inked, dark and menacing spaces, with architecture and geometry that are often physically impossible — almost Escher like. 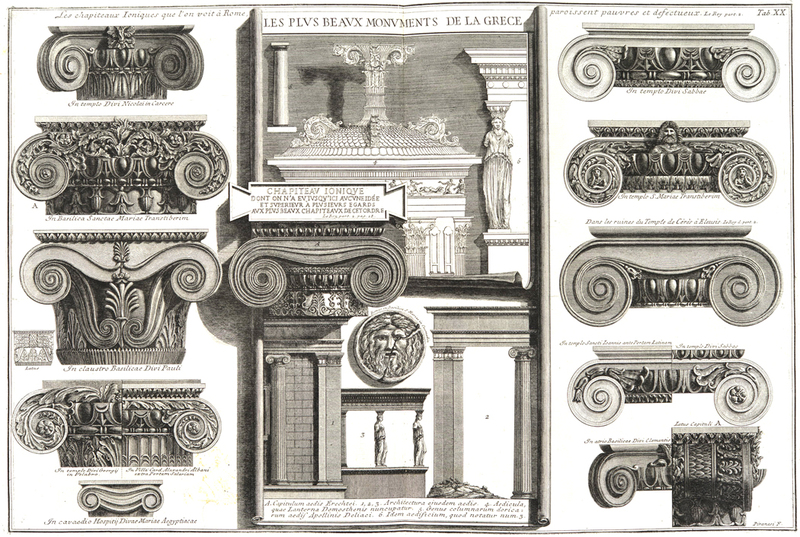 The 1761 version of the plates were enormously popular and were reprinted many times. They leave behind the comfort and orderliness of the 18th Century and look ahead to the Byronic, irrational and psychologically disturbing Zeitgeist of the early 19th Century. They are a harbinger, a precursor, a herald. 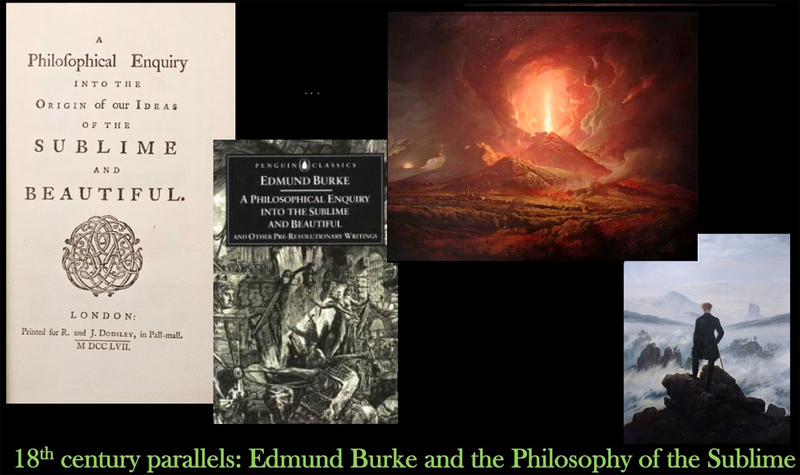 They are a manifestation of the sublime — a concept fresh in the culture, with a translation, in French, by Nicolas Boileau-Despréaux of the Perihypsos (“On the Sublime”) of the Roman author Longinus, and a book-length essay on the subject by English writer and politician Edmund Burke. And so, the Carceri cannot be made coherent and understandable. The prisons expand outward into unseen spaces that open again into other unseen spaces. There are stairs to nowhere, torture devices in the shadows, catwalks over bottomless pits, stones overgrown with moss — and many tiny, nearly unseeable figures, caught in this Kafka-esque labyrinth. 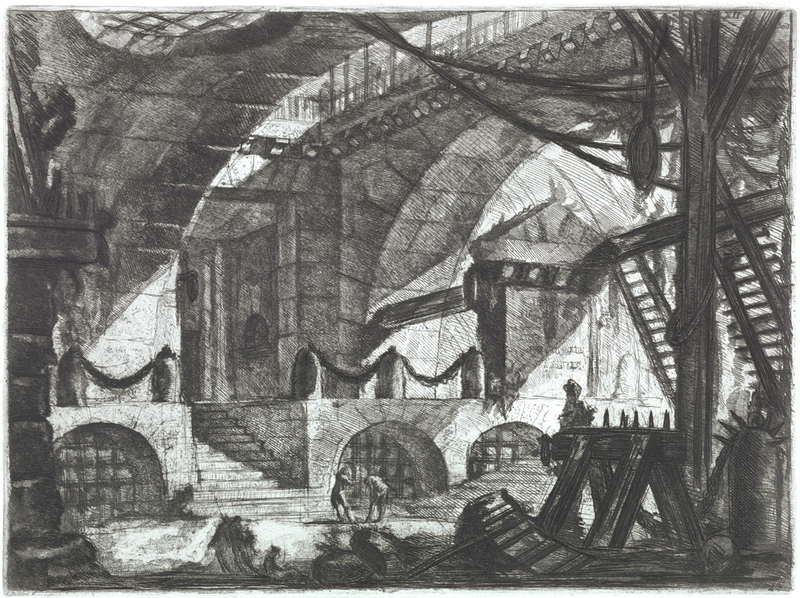 —You can find a wonderful animated tour through Piranesi’s prison on YouTube (link here). 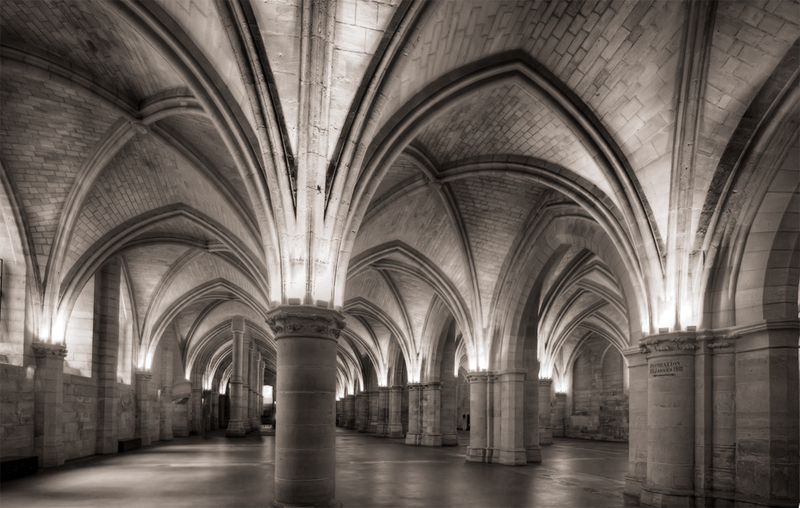 And you can get some of the effect in reality in the actual Medieval prison, the Conciergerie, in Paris, where Marie Antoinette was held before her beheading. 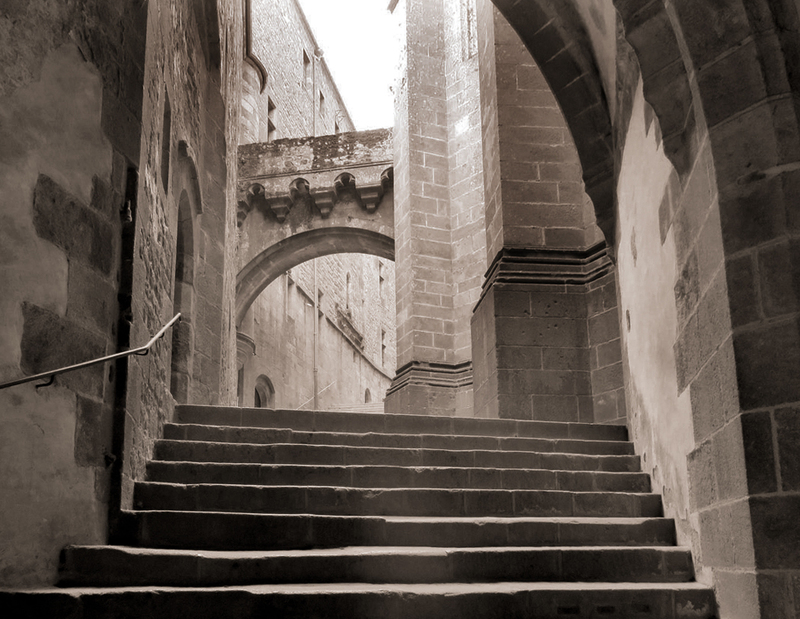 Or the rambling stairs and arches of Mont St. Michel at the border of Normandy and Brittany. 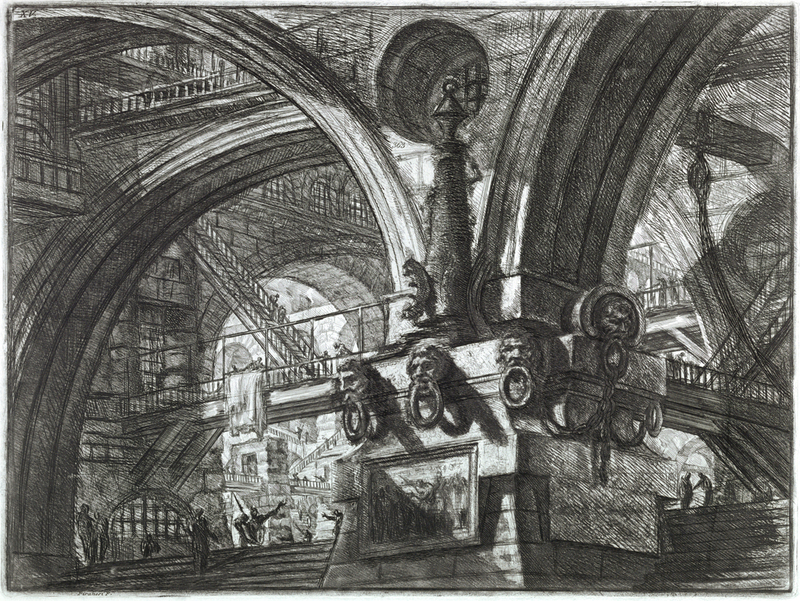 The Carceri are not anomalous for their subject alone: Unlike Piranesi’s usual draftsmanlike exactitude in his drawings, the prisons are nearly scribbled onto the etching plate. 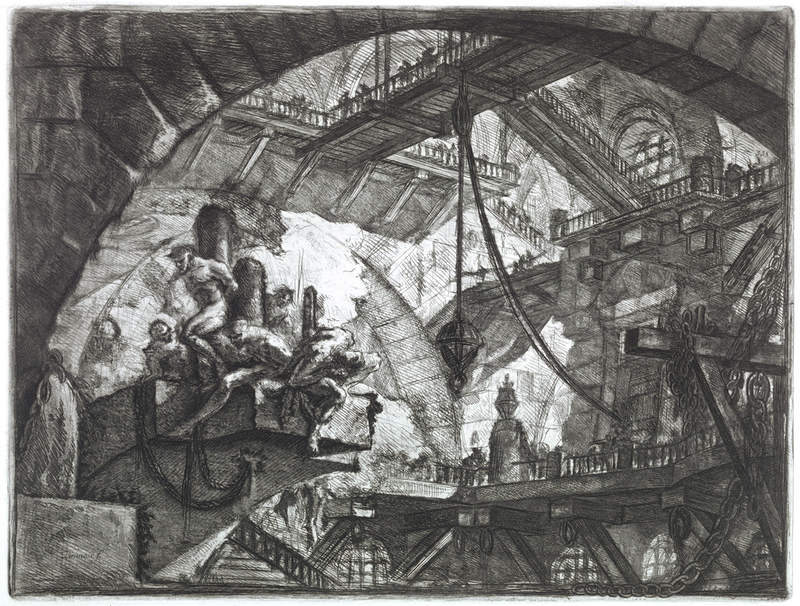 They imply a kind of fury in their creation, as if Piranesi were trying to get his vision down into line before they evaporated from his boiling imagination. 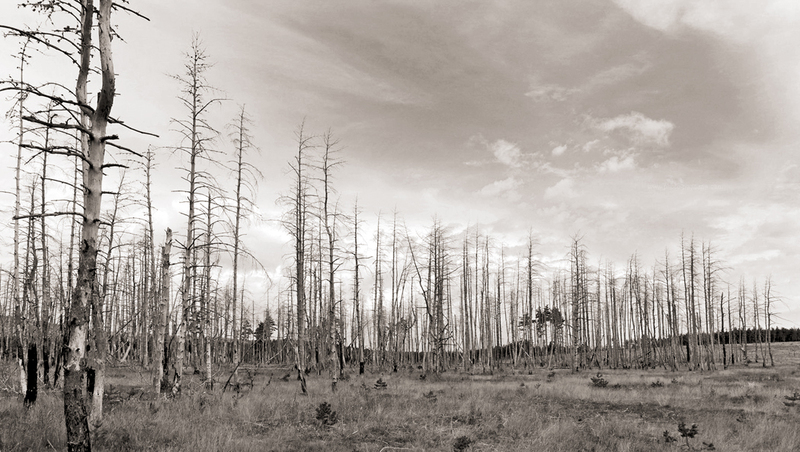 Shelley once described the moment of creation as an ember rapidly cooling that needs be indited before the glow darkens. 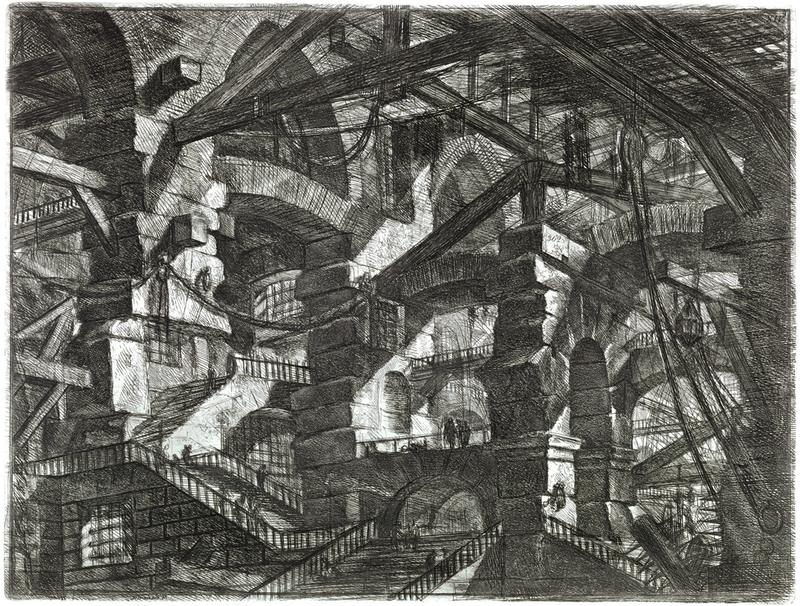 You can see Piranesi frantic not to lose the hallucination. The change from Classicism to Romanticism — like the change from the Renaissance to the Baroque — is not simply one of rationalism curdled to emotionalism, but of clarity as a virtue lost into a fog of ambiguity and incoherence. It is Racine metamorphosed to Rousseau. 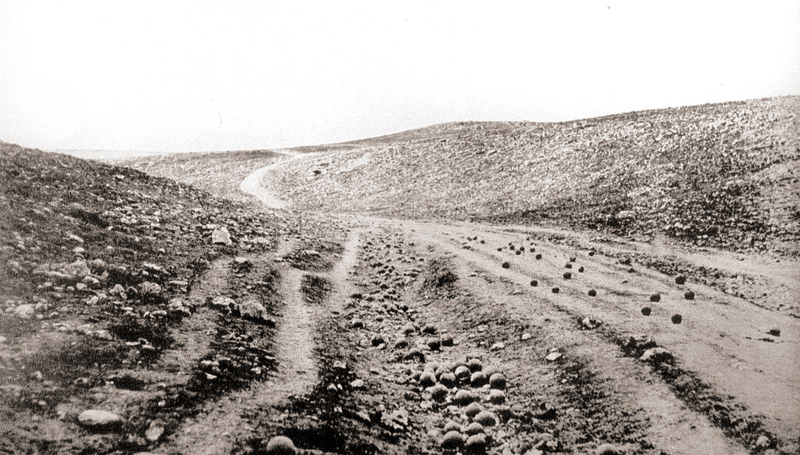 The subject matter had enormous influence as the 19th Century was born. It is the Venetian prison and escape described by Giocomo Casanova in his 1787 Story of My Flight and later in his memoirs. 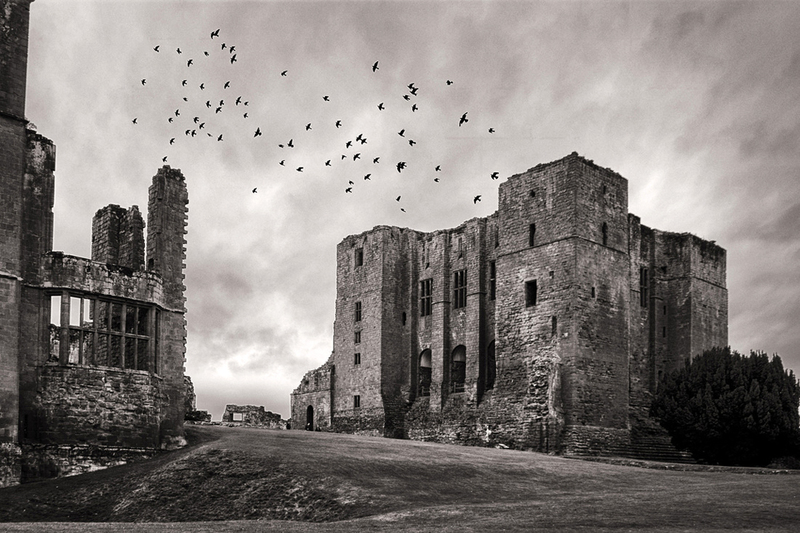 Prisons and dungeons are everywhere to be found in literature, art and music. 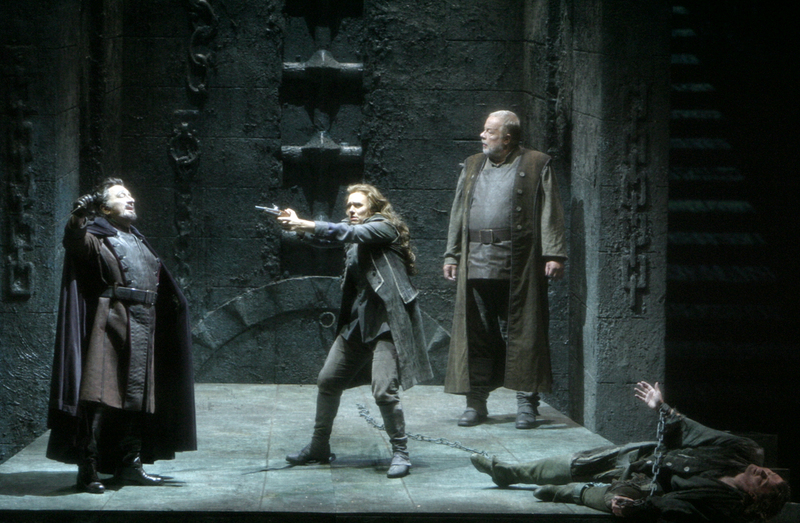 It is the prison where Florestan is rescued by Leonora in Beethoven’s opera, Fidelio. It is the dungeon where François Bonivard meditated in Byron’s Prisoner of Chillon. It is the prison that Alexandre Dumas, père, put The Man in the Iron Mask. 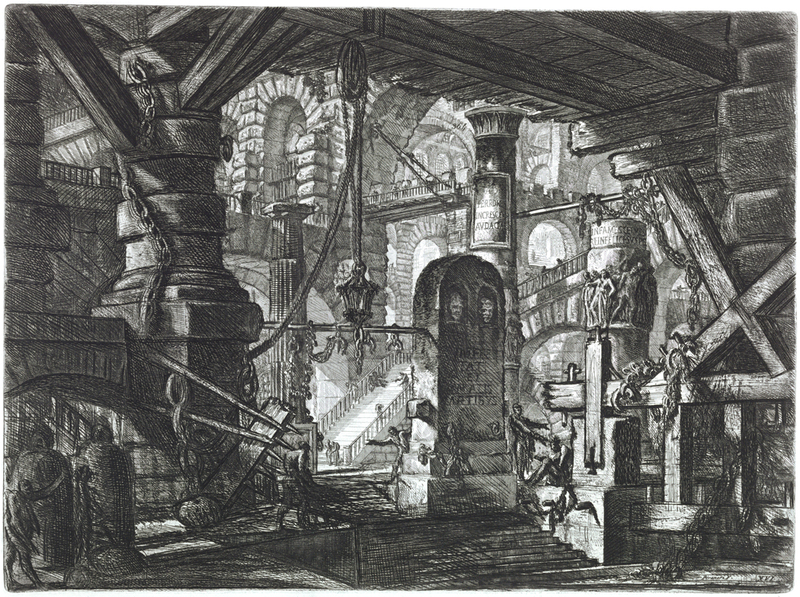 It is the torture site of the Inquisition in Edgar Allen Poe’s The Pit and the Pendulum. Not the least, it is, historically, the Bastille in Paris and its siege and fall that set off the French Revolution. It is a trope that continues into the 20th and 21st centuries. 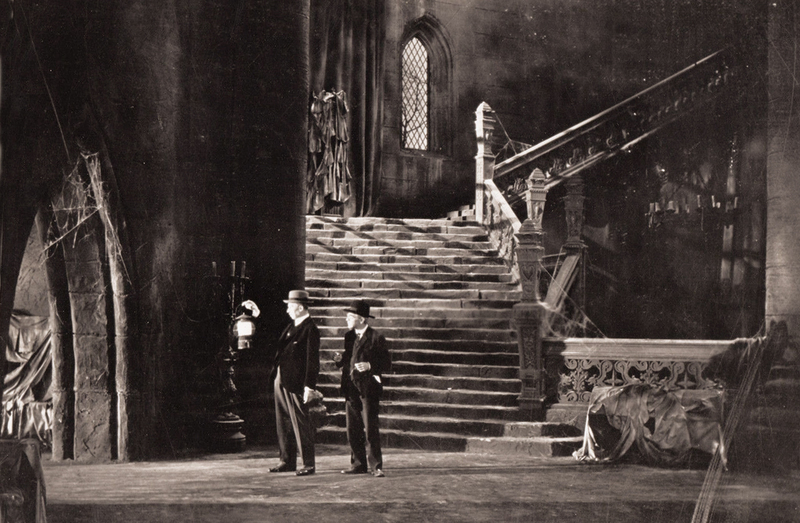 It is Carfax Abbey in Tod Browning’s 1931 film, Dracula. 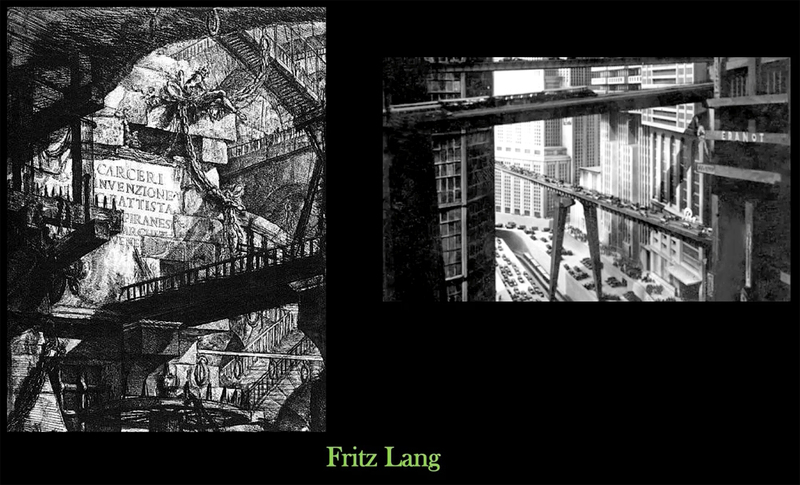 The very gantry ways and bridges make their way into Fritz Lang’s Metropolis. Now, that same spacious gothic sublime turns up in fantasy films, such as Lord of the Rings, on TV in Game of Thrones and in nerd games, like Dungeons and Dragons. 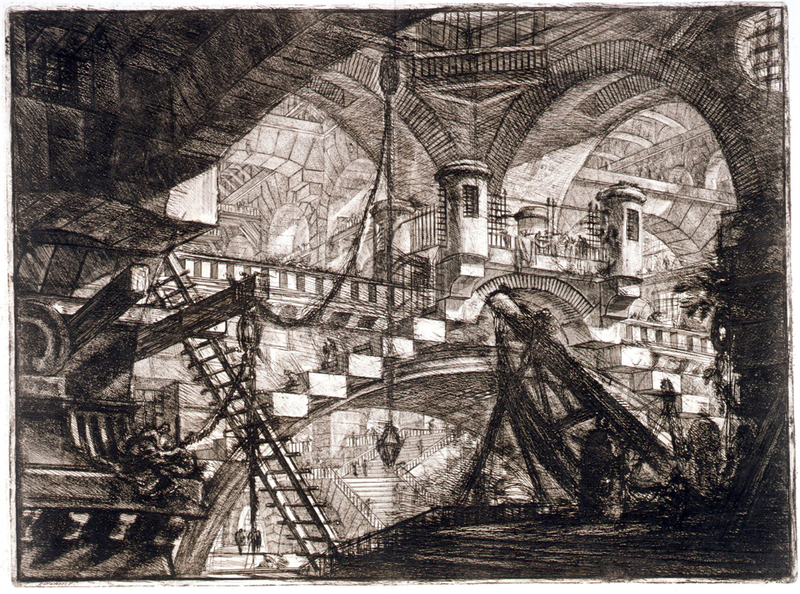 You can find its inception in 1761 with Piranesi. I’m having one of those inward days, a combination of reading Viktor Frankl’s recollections of his time in Nazi concentration camps, and listening to Franz Schubert’s “Death and the Maiden” quartet while driving to pick up my granddaughter at high school. Music can conjure up whole worlds and philosophies: Thought doesn’t necessarily come in words. 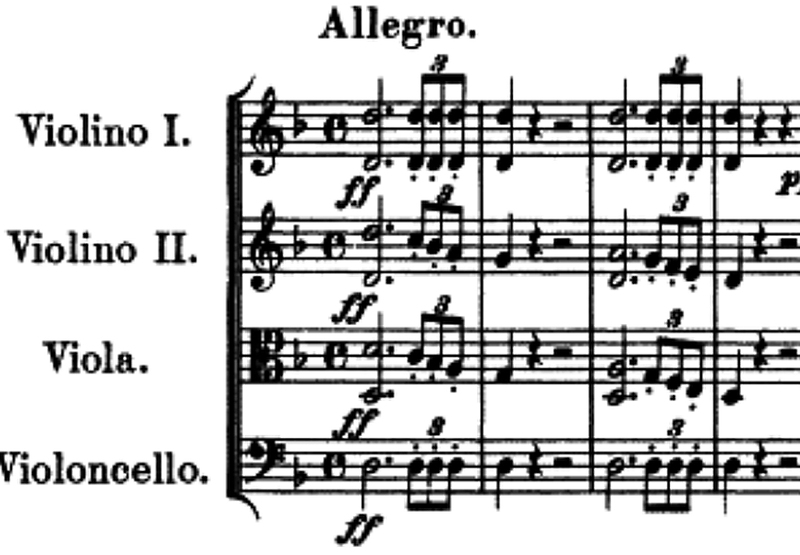 It isn’t the words or the title to the lied that Schubert wrote based on the poem by Matthias Claudius, but the music itself, opening with a unison fortissimo D in all four instruments, a triplet figure C-B-flat-A, over a constant D bass, resolving to an open fifth, with D still in the bass and a G in the viola and second violin. It is loud, it is oppressive, it is hollow, with no third to define whether it is in minor or major. It is the sound of an empty universe. One of the most powerful openings to any quartet ever, and one that can rip your heart out (Link here). That, and the Frankl book and the specter of Auschwitz, turn on the Weltschmerz current, full voltage. 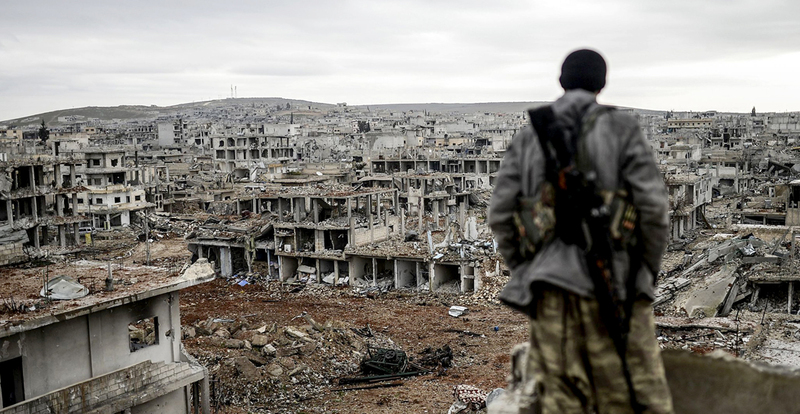 One becomes intolerably aware of suffering, heartbreak, death, war, famine, loss, hatred, divorce, the death of children, fear, dread, oppression, disease, injustice, crime, humiliation — and one’s own finity. And with my teenage granddaughter in the car, we talk of cheerier things, but there hangs over the conversation that Lebensleid. I remember when I was her age, and the pangs of emotion that exploded in my adolescent heart. My emotions seemed so big, so important. Nothing could be more overwhelming than the pains of a teenager. But when I look back, I realize how self-involved that suffering was. I wore all of myself on my sleeve. But an entire life has passed, and the mortifications have accrued, the losses have piled high, the debilities have increased, and the world has gotten no better. 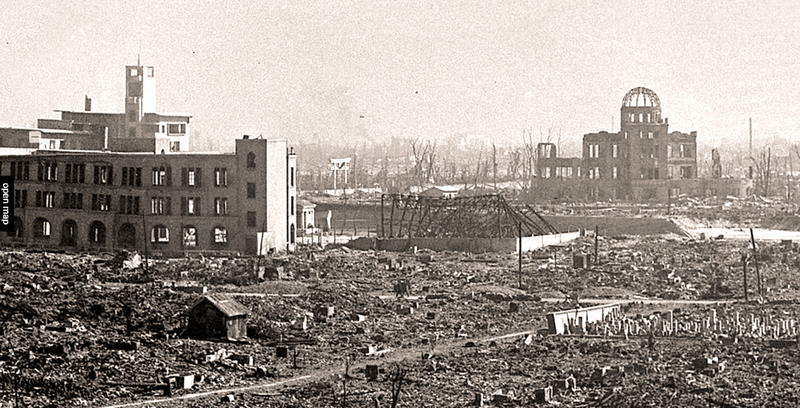 I watched a film made in Hiroshima a few days after the surrender, and could hardly miss the similarity of the devastation to the nightly footage from Syria or Yemen. Rubble flat on the ground from horizon to horizon. And when you know what old books tell and that no better can be had, know why an old man should sob and weep. The Weltschmerz of a young Werther rings false, a player playing a part, assuming a self-importance not earned. But as an old man, the suffering isn’t mine, it is the world’s; I see it and my heart cracks wide. So much lost, so much vanished, so many deaths, so many things left unsaid or undone for fears, valid and phantasmal. It weighs heavy. I will carry to my grave — as will everyone else on this planet in their own time — all the experience I have lived through and suffered or enjoyed. It cannot be conveyed from one sensibility to another. Bits and pieces, yes, but the vast preponderance will evaporate, only to learned the hard way once again by generation after generation. So, the granddaughters will experience heartbreak, perhaps divorce, illness, disruption, disappointment and the death of those they love as they have already suffered that of their grandmother. It will all build up the backpressure of Schmerz in their own lives, leaving them to sorrow over their own inability to use that experience to protect those they love. It is no wonder the innocent young look at us with such pity.